Details are in, Nokia has a new flagship phone. The N97 packs a 3.5-inch, 640 x 360 pixel (that's a 16:9 aspect ratio) resistive touchscreen display with tactile feedback and QWERTY keyboard into this sliding communicator with an "always open" window to favorite internet or social networking sites. Nokia calls it the "world's most advanced mobile computer." To back up the claim they've dropped in HSDPA, WiFi, and Bluetooth radios, A-GPS, a 3.5-mm headjack, 32GB of onboard memory with microSD expansion (for up to 48GB total capacity), and a battery capable of up to 1.5 days of continuous audio playback or 4.5-hours video. 5 megapixel camera with Carl Zeiss glass and "DVD quality" video capture at 30fps, too. The specs are certainly impressive, let's see if the S60 5th Edition OS can support it. The N97 will launch with a retail price set at around €550 ($693) excluding subsidies and taxes, phone to ship in H1 2009. 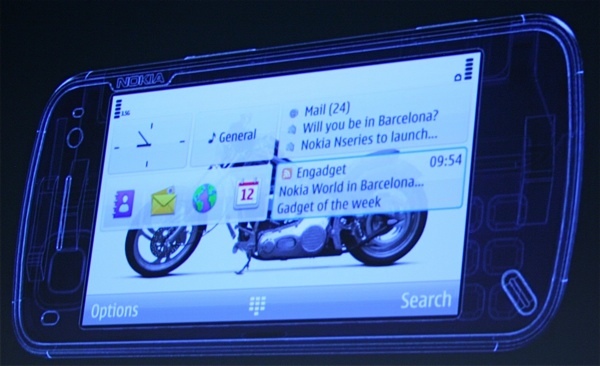 Update: Hah, Nokia just boasted on stage at Nokia World that the N97 was the scoop "Engadget didn't get." O RLY??? Sure looks like the device codenamed Eitri that we broke to the world last month. Update 2: Video demonstration after the break. Update 3: Thanks for the widget love, Nokia (pic after the break, and thanks Eric).